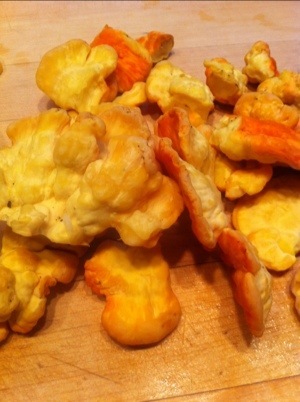 We had a great dinner the other night with an unexpected ingredient – Chicken of the Woods mushrooms! We’ve had some rainy days lately, which means mushrooms popping up all over the place. 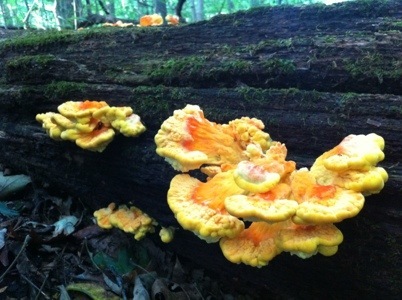 We went on a hike through some moist woods after a night of rain and there were mushrooms everywhere. 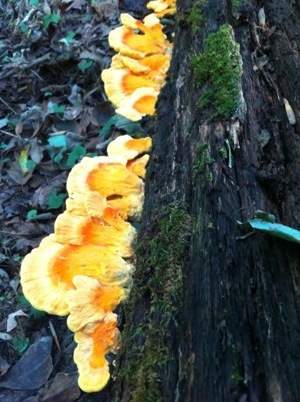 It was a really nice hike with some great fungus spotting. 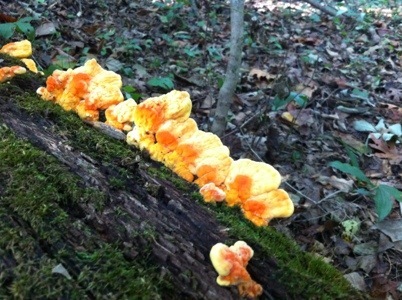 As we hiked through the woods, we happened upon a big patch of Chicken of the Woods mushrooms. I have never eaten this type of mushroom but there are tons of recipes on the internet for them. 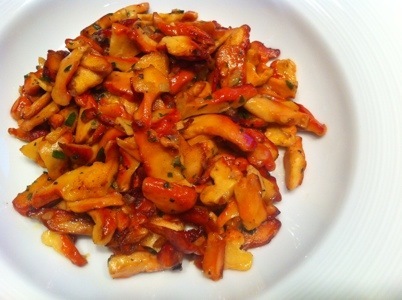 Some consider these mushrooms a delicacy, so needless to say – I was excited to try them! 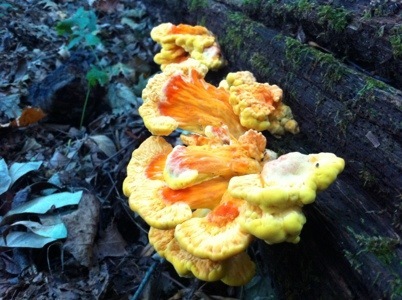 These mushrooms are vibrant and beautifully colored. 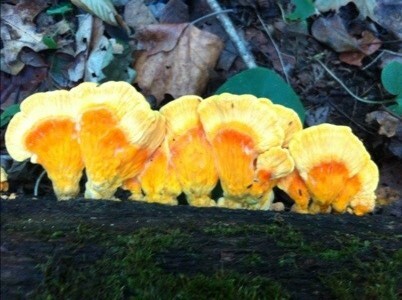 They surprised us as we rounded a bend and saw the bright orange and yellow colors that stood out against the brown of the rotting log that we found them growing on. We only collected the smaller ones from the log. The smaller ones are more tender so we left the larger ones still growing on the log. We also didn’t want to collect them all, you’ve got to leave some behind. When gathering edibles, you always want to leave enough in the woods to reproduce so you can find them growing again. 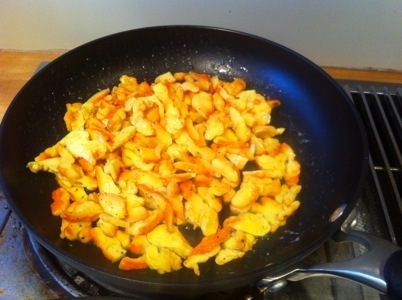 Saute the mushrooms in 1 1/2 tbsp. of butter for about 5 minutes over medium heat. Stirring occasionally and carefully – I just flipped them over in the pan. Take the pan away from the heat and pour in the brandy. Allow it to bubble and place it back on the heat when the bubbling subsides. Cook the mushrooms for 5 minutes more and add in the onions and the chicken stock. Cook the mushrooms for 10 minutes more and add in the cream and parsley. Cook the mushrooms for a final three minutes, mixing in the cream. Smash the garlic using a pinch of kosher salt and the side of your knife blade so that all of the oil is being released and it turns into sort of a paste. Saute the onion in the butter over medium heat for 3 minutes, until the onion is translucent and add the smashed garlic. Add in the zucchini and squash and saute for about 8 minutes, just until the squash starts to turn soft. 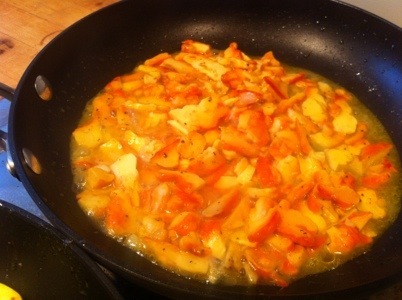 I don’t cook the squash for a very long time because I really like it to still have crunch to it. 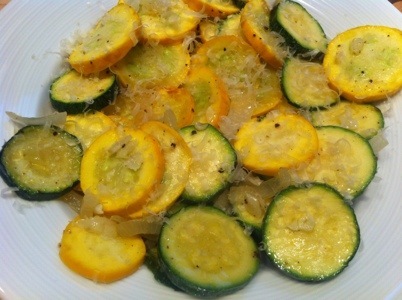 Remove the squash from the pan so it doesn’t keep cooking and sprinkle with parmesan cheese. good quality extra virgin olive oil good quality balsamic vinegar – I used the latest ones from my Global Gardens olive oil club. Mix the ingredients in a bowl and serve with shaved Parmesan cheese on top. Pat the steaks dry and sprinkle them with the salt and pepper on each side. Rub the steaks with clarified butter to coat them. 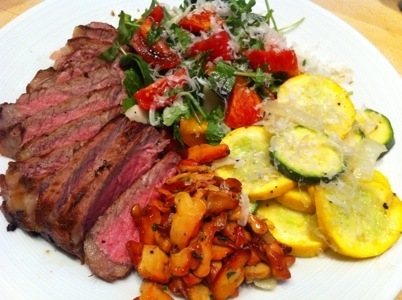 Grill the steaks over a hot grill – we like to cook steak so it’s medium rare. It will take about 12 minutes for a 1 1/2 inch thick steak. Make sure your grill is really hot so you get nice seared grill marks on your steaks. Place them on the grill over the hot coals and leave them alone for 5-6 minutes – don’t move them around the grill! Flip them over and cook for 5-6 minutes more. Remove the steaks from the grill and wrap in aluminum foil. Let them rest for about 5 minutes before slicing so the juices can redistribute throughout the meat. This meal was a great experience. Eating food that I have gathered myself gives me great appreciation for food that I eat. One of my favorite things is trying new foods and new recipes. It makes it really special when you know that you have found something great that you may or may not find again easily. If you try gathering your own edibles, be sure to identify everything correctly! It is an interesting experience finding things that you didn’t know were around… or that you didn’t even know you could eat! Just be sure to leave some of the plants or other edibles where you found them so they can reproduce in that area. You always want to be able to find them again some day. I saw this type of mushroom on the side of a tree the other day. I had no idea what it was. very intersting! thanks for sharing! Wow that looks great. How do you know what mushrooms are edible? I would love to go mushroom hunting. If you get a mushroom identification guide, it should tell you if they are edible or not. Now is a good time to go with all the rain we keep getting – Happy hunting!